STOCKTON - A tight points race became even tighter Saturday night in the Western Late Models division at the Stockton 99 Speedway with Modesto's Jeff Belletto overtaking Roseville's Matt Scott in the season standings at the midway point of the season. 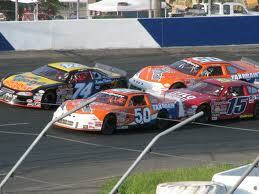 However, it was Nic Belletto #15, Jeff Belletto's nephew, who stole the spotlight with double wins in the premier event. Nic Belletto, 22, claimed his second and third career victories and celebrated by spinning doughnuts in front of an estimated crowd of 1,200. "I got more wins tonight than I've had in my whole career," said Nic Belletto, who took the lead on lap 24 and was chased the rest of the way by his uncle. "I was feeling (Jeff) tearing my bumper off for those last 10 laps." In the initial Western Late Model 50-lap race, Nic Belletto led from start to finish. "I was really concerned to start on the outside against (Jeff) because it's normally not an advantage," Nic Belletto said. "But this car got out to a good run, and I've never drove so hard in my life trying to stay ahead of him." Jeff Belletto now has the overall lead in the standings, sending Scott into second place by 12 points. In the night's first main event, Stockton's Ben Lewis II returned from a month off of racing to edge Lodi's Brandon Jones for the win in the Pure Stocks' 30-lap race. Jones had the lead midway through the race but Lewis passed him in lap 19 and barely held on for the victory. "I knew I didn't have the car to pass him," Lewis said of his second win of the season. "Everyone screws up - even I do - and I almost did on the last corner. My car loosened up and all the sudden he was right next to me. It was a close finish." Trophy-dash winner Guido Bindi of Stockton was knocked out in lap 23, while Darin Adler and Rodney Tripp, both of Stockton, collided in the second lap and couldn't recover. In the Grand American Modifieds division, Roseville's Jason Bamberg won the first 40-lap race after trophy-dash winner Jay Lindstroth crashed in the 23rd lap while trying to lap another car. Lindstroth, of Citrus Heights, returned to start on the pole for the second 40-lap event and he never gave up the lead. Manteca's Joseph Reichmuth won the B-4 30-lap race after also claiming the trophy dash. In the Super Stocks, Robbie Knittel claimed the win after Jason Aguirre won the trophy dash. 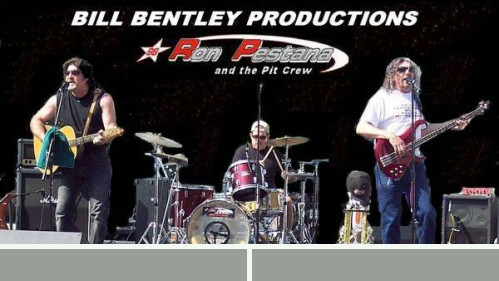 Ron Pestina and the Pitstop Band entertained the crowd at 99's re-opening in 2008. American Speedway in Roseville. Track announcer Wayne Pierce said he remembered hanging around Stockton 99 with Pestana in their youth. "He loved this race track," Pierce said. "He called himself an on-the-fence race kid because they would always have to caution him to back away from the fence." His songs, music and memories will live on." 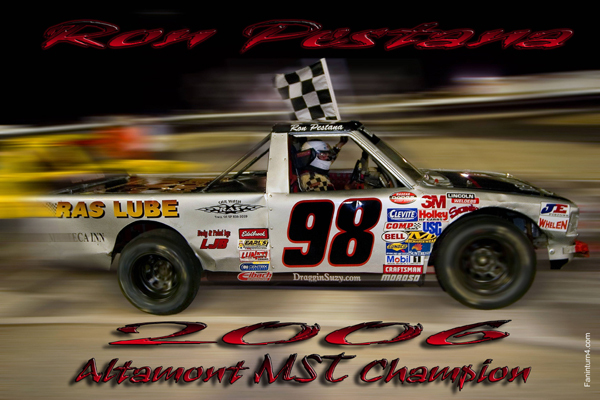 Pestana's song "Saturday Night Short Track Racing," which mentions Stockton 99 Speedway, was played during an honorary lap prior to the main event racing. Tracy's Glen Cook drove his late model car around the track while holding a checkered flag out the window with an estimated 1,000 fans cheering as he reached the finish line. The 99 Speedway will take a week off before action returns Aug. 4.